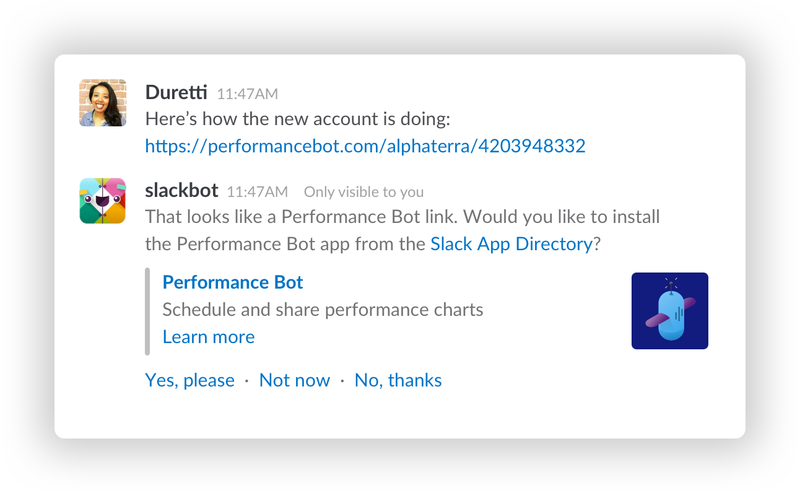 As part of the App Directory, Slack can suggest your Slack app to new users when links containing the domain name associated with your app are mentioned in conversation. While managing your Slack app settings, you'll find a snippet of HTML customized for your application under Manage Distribution. It's a simple META tag declaring your Slack app's ID, which typically begins with A. If you already know the ID, you can build one of these tags yourself. With this HTML in place, Slack is ready to suggest your app to new users on workspaces it isn't yet installed on. Let's take a hypothetical example. @beforebot is a Slack app in the directory that has placed its app ID meta tag in the template of all pages on https://before.bot/. On a workspace where @beforebot is not installed, @ada posts a message talking about the link https://before.bot/movies/flight-of-the-navigator/trimaxion. As you can see, app suggestions are a fantastic way for users and workspaces already engaged with your product or service to discover your Slack app. Once installed, your app can attach custom unfurling behavior to relevant links shared in messages, among all the other nifty things bots and apps can do.